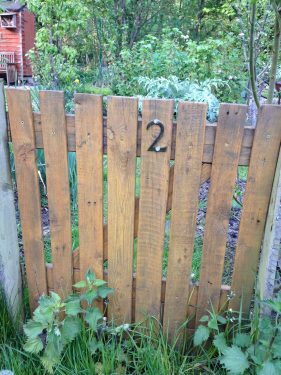 The Reluctant Gardener has been on a woodwork course. It was great even though it turned out to be for people with mental health problems. I suppose I should have guessed when the application form asked me if the course would help me cope better with daily life. But writers are compelled to craft careful replies to all questionnaires. So I described (with examples) how gardening and other practical hobbies helped me deal with stress. There was supposed to be a waiting list for the course but I was offered a place immediately. On the first day, I was alarmed to see that the other participants were all male and at least thirty years younger than me. Some had care workers with them. And from the way the organizer talked to me in a loud, slow voice, I realized she thought I had mental health problems too. Some may agree with her. But during the five weeks of the course I discovered a sobering fact. When people treat you as though you’ve got learning difficulties, you start having learning difficulties. I went on and on committing what the french term ‘betises.’ The drill wobbled in my grasp and screws went in aslant. I gouged ugly chunks out of my ‘project’ with the chisel. I tried to use the plane upside down – and wondered why no wood shavings came out. Lovely Tom corrected me gently. He was a gifted tutor with the knack of being there just before someone lopped their fingers off with the circular saw or got dragged across the room by the belt sander. I caught myself hoping that he saw me as ‘normal’ (whatever that meant). But in the end, the question of who had ‘issues’ and who didn’t became irrelevant. All the group were better at woodwork than me. And they were avuncular, despite their youth. They steadied planks while I sawed wonkily and held my work as I tried to bang nails in straight. One even offered me the bedside cabinet he’d spent five weeks making. The tutor gently discouraged him. I enrolled on the follow-on course – and the one after that. What has all this to do with gardening, I hear you ask. Well, my motive was to gain skills that I could use at the allotment. I did and I have. In the garage, at Dad’s old workbench, I made a gate, an outdoor table, a bench and two planters. 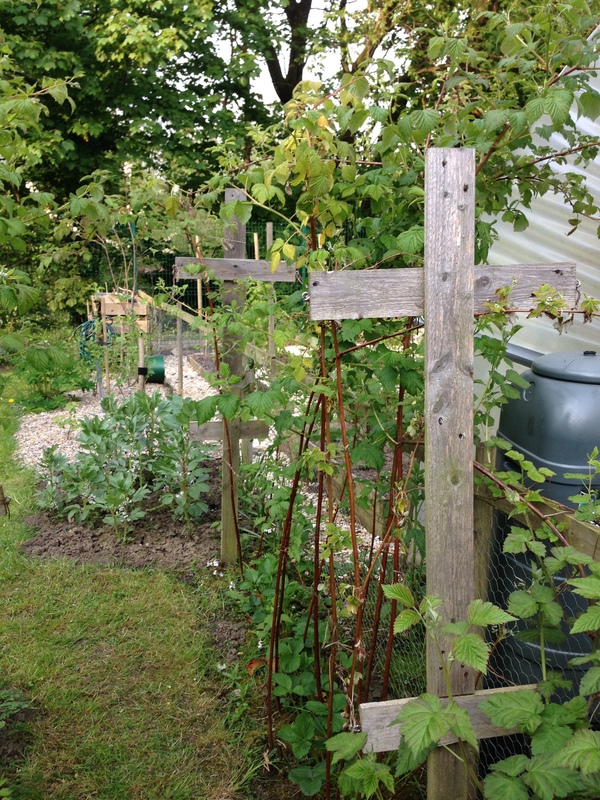 I also made some cross supports for my raspberry canes that turned the allotment into a site of religious pilgrimage. My attitude is not that of a master craftswoman. My slogan is ‘that’ll do.’ I’m happy if people can sit on my bench without getting a splinter up their backsides. A lowly goal but enough for me. If the bench falls apart in a year, I will make another one. On the sideboard he made himself, Dad keeps nine little blocks of different woods, planed and polished to show the grain. He often stands (as best he can at 93) and turns them over in his hands. And smiles. I have begun to understand why. so are you taking orders? Moo, Jacqui, Sue and Lyn – thank you so much for taking the time to read the post and comment so kindly on it! I can’t tell you how much I appreciate it. So happy to hear from The Reluctant Gardener! Yes, woodworking is definitely mental therapy. A carpenter solves as many problems as an engineer working on a project. Wood is a natural product with its own personality. Each species has different characteristics that the woodworker should appreciate. Some of my friends enjoy wood turning to create bowls and sculpture. Enjoy the satisfaction of creating your own unique art. Couldn’t agree more, Lamar. Thanks so much for commenting. My pleasure, Elaine. Great to hear from you as always! I think it’s very appropriate that a reluctant gardener should enrol on such a course. I was impressed by the gate! Thanks Pete, glad you think so! Always great to hear from you. Rustic Woodwork – Brill Mandy. I laughed so much I even cried. Really cheered me up. Seriously though, my Dad got into carpentry after he retired and made some lovely furniture for family and friends which was all french polished by himself. He just loved wood and working with it. So glad my ramblings had a cheering effect on you, Christine! Thank you for such lovely comments. It is heart warming to think of your Dad making furniture too. So good to see your posts again. I have turned a space in my yard over to two young women who don’t have garden space. It will be fun to see what they do with it, if they follow through. So far they’ve organized and recycled some things that I hadn’t got to… so there’s that. My mantra is “it’s theirs now”. In other news: drawings – they even sell, which still amazes me – a part time job leading visitors on walks in our countryside, some volunteering, and … indoor plants. Oh, and a fascination with weather. http://josephoregonweather.com/ – here’s ours. Great to hear from you Kathy and glad that all’s well with you. It is good of you to share your yard – hope that proves mutually beneficial! Great to hear from you J and J. Hope all’s well with you. The shed steps, made out of plywood by my Dad 5 years ago, are looking wonky so that’s my next project. It would be a challenge and could take a few weeks. Or I could just put down some bricks to stand on, which would take a few minutes. Which would you do? Thanks Mandy. What an inspiring and thoughtful blog. I’ve always fancied working with wood – at the very least it would be good to be able to repair our log store. Confidence is key. I relied so much and for so long on my dad for doing all those types of jobs that it now seems too late to learn. Your example has made me think otherwise and YES to things being ‘good enough’. I think it also might be time for me to resurrect my blog (another great example you’ve provided). Thanks Mel for such kind and appreciative remarks. It would be great if you took up woodwork (and resurrected your blog). You might be interested in the courses over at The Hive in Shipley – I did a joinery course there, which was good (if tricky) and there’s Chris Tribe in Ilkley. Greenwood working is fun too and there are courses in Sheffield and at our very own Bolton Abbey. Let me know how you get on! Thanks for commenting, Char. Yes, it’s amazing to make something that has a physical presence and that’s actually useful, isn’t it! Hi Mandy, I always wish they’d taught us something useful at school! But seriously, if you fancy a visit to this side of the North Sea, let me know. I’ve committed to making an inside door (because it needs an arched top and the quote from the carpenter was 2000 euros) – now just to cut that arched top……, could do with your expert advice. p.s. where do you live now, Fay? ‘This side of the North Sea’ sounds very intriguing. I have every faith that you could make a replica of your Dads plywood steps! Thanks for the vote of confidence Joe! Also for the potential lend of the router, a marvellous tool. Hope you’re both well and enjoying the last of the summer.